Equally useful is the fact that the maps are Creative Commons licensed, so they can be used for free for any non-commercial purpose so long as the site is attributed — hence can be used in publications as well as theses, presentations, etc. Of course, the site doesn’t work perfectly. If you work on a time period it doesn’t cover (like the Bronze Age) and/or on particularly obscure sites, you’ll have to do an awful lot of laborious looking up sites’ locations and adding them manually (as I did for the map above); it can also take a very long time to load when zooming/panning, and although there’s a function to print your map to a PDF, I haven’t yet managed to get it to work — taking a screenshot is more reliable. And be warned, the site won’t save your maps itself — I accidentally navigated away from the page in the middle of making one, and had to start all over again. But exporting the map as a .json file allows it to be uploaded to the site and further edited later. However, none of that changes the fact that free, open-access*, fully-customisable maps specifically for the ancient world are an amazingly helpful thing to have, and all credit to the AWMC for making this resource available! This is fantastic. I suspect it would have saved me a lot of time drawing out maps by hand in Illustrator (though that taught me how to use Illustrator, so it’s swings and roundabouts). It looks pretty decent but I haven’t tried that one myself. Mycenaean Google Earth would be awesome, but sadly I can’t get it to work right now. Will keep trying! I just tried and it works for me. You need to follow the link in the comments (or here: https://productforums.google.com/forum/?fromgroups#!msg/gec-history-illustrated-moderated/CNt4mYxS1tc/dsgj4ShDM1wJ) and download the .kmz. And you can use that and the Near East one at the same time. Which ought to cover most eventualities. Aha! Now it works, excellent 🙂 Can we add this to the resources page too, Hannah? This is nothing to do with anything any of us study but is nonetheless VERY COOL. Even I think so despite not being an archaeologist. That Stonehenge thing is fantastic! That is exactly the kind of thing archaeologists should be doing to make results accessible and intelligible. The narrated tour is very clear and engaging, and then there’s all the more detailed information available if you want it. Absolutely exemplary! I wish this had existed when I was living and working as an archaeologist around that area. I often drove to site past half the places mentioned, but without a background in British archaeology, it was really hard to get my head round how they interrelated (and sadly commercial archaeology doesn’t leave much time for research). I hadn’t realised you could do stuff like this in Google Earth, but just think how much scope there’d be for 10-minute mini-lectures on Classical Landscapes or something, if you could find a platform to publicise them. It would be amazing if somebody made downloads like this for Classical/Bronze Age sites. I can definitely see it being a really good thing for, e.g., the palace of Knossos, especially for talking about the reconstructions, different phases of the building’s use, etc etc. I would definitely use that! Very cool! We should add this to the resources page. Yes good idea! I’d add it myself but I suspect I can’t edit that page? A good excuse to make my maps today. Splendid. Pleased to see that you have discovered Antiquity À-la-carte and are finding it useful. AWMC is always happy to feedback you might have about the application. 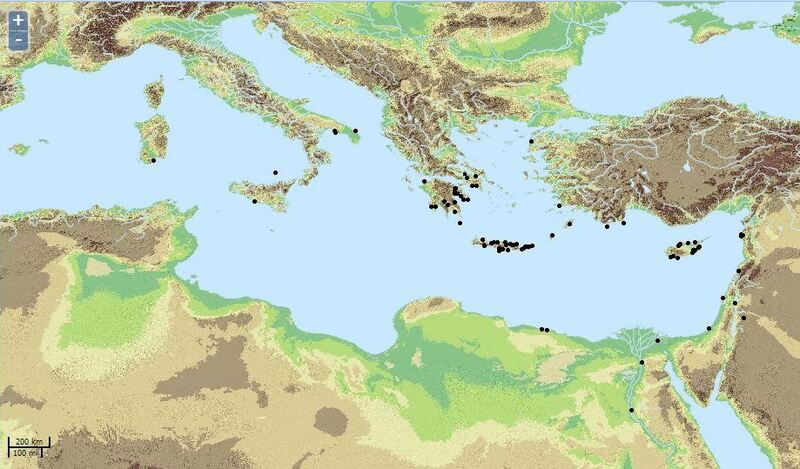 The Bronze Age Mediterranean was not covered in the data set compiled from the Barrington Atlas, but Bronze Age sites can be incorporated in a more permanent way if community members join the Pleiades Project (pleiades.stoa.org) and add Bronze Age content. Thank you very much! I will certainly have to look at the Pleiades Project.